If there was ever an award for "Coolest Bus in the World," surely the Disney Resort Cruiser line of busses would be a contender. A clash between Disney and Art Deco, these busses are certainly the most eye-catching things on the roads around Tokyo Disney Resort. If you spot one of these busses from far away the first thing you'll probably notice is the giant Mickey Mouse silhouette on the side. As you get closer, you'll notice that Mickey is represented everywhere, from the ornament on the top fin to the shape of the taillights. There are so many—many of which are cleverly concealed—that it would be quite an achievement to find all of them. 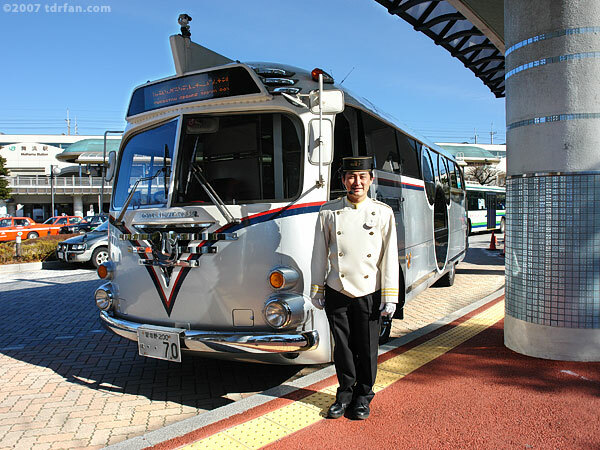 There are two routes the busses run, one between the Ambassador Hotel and the two parks (Tokyo Disneyland and DisneySea), and the other between the six Disney Resort Official Hotels that line the Tokyo Bay perimeter of the Resort and the Disney Resort Line monorail's Bayside Station. Unlike the Resort Line monorail, a ride on a Resort Cruiser is absolutely free.